At present, the Stirling Smith mounts between 14 and 20 temporary exhibitions each year to attract return visits and maintain interest. The painting by the eminent Scottish artist Sir William MacTaggart (1903-1981) was purchased from a very brief exhibition on contemporary Scottish art in the Smith in the summer of 1959, when the artist’s reputation was at its highest. MacTaggart was the grandson of the Scottish land and seascape painter of the same name. He studied at Edinburgh College of Art, 1918-1921, and taught there, 1933-1958, influencing a generation of artists. He himself was influenced by the French artist Rouault, whose work he saw in Paris in 1952. The rich glowing colours and soft black outlines in many of his works references those of Rouault. MacTaggart was part of the Edinburgh school of artists, which included William Gillies, Anne Redpath, John Maxwell and William Crozier. The Smith has examples of all of their work. He served as President of the Royal Scottish Academy 1959-1964, and was knighted in 1962. This is one of 73 paintings by MacTaggart in public collections throughout Britain. 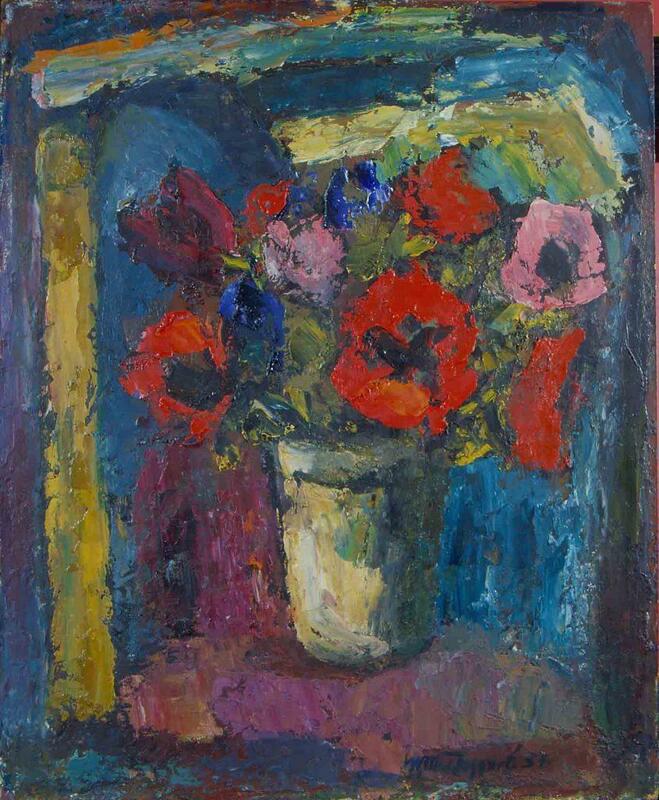 Poppies were a favourite flower of the artist.